Placer County Supervisor Jennifer Montgomery shared this photo from the Serene Lakes area near Soda Springs at Donner Summit, showing a solid foot of snow as of Sunday morning. 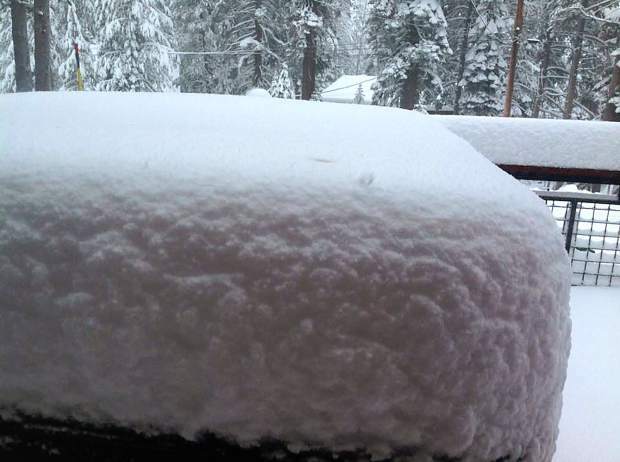 TRUCKEE, Calif. — Nearly a foot and a half of snow fell at high-elevation areas across the Truckee-Tahoe region this weekend, and with more snow in the forecast, it’s shaping up to be a white Thanksgiving. Elsewhere, according to unofficial totals published at resort websites, Squaw Valley Alpine Meadows had seen 7 inches as of Sunday, while Homewood Mountain Resort, on Lake Tahoe’s West Shore, saw 6 inches fall at higher elevation levels. “The heaviest snowfall will likely be between 10 p.m. Tuesday and 4 a.m. Wednesday morning,” according to NWS.